Estonian driver Juri Vips (Prema Powerteam) is the 2017 ADAC Formula 4 champion! The 17-year old Vips entered the season’s finale at Hockenheimring as one of three title contenders, together with Marcus Armstrong (Prema) and Felipe Drugovich (Van Amersfoort Racing). Vips was the race winner just two times in 2017, against three wins of Armstrong and seven wins of Drugovich, but the consistency was decisive. Vips showed consistency once more at Hockenheimring, collecting more points than his rival to end a championship on the top, with 4.5 points more than Armstrong and nine points more than Drugovich. Drugovich was a winner of the first race on Saturday morning but he retired in the second race on Saturday afternoon, what ruined his chances to start the last race as the leader. In the last race, Vips finished third, one place behind Armstrong, what was enough to defend championship lead. 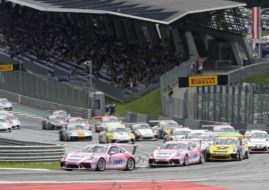 Other race winners in the final weekend were Lirim Zendeli in Race 2 and Artem Petrov in the Race 3.